National Read a Book Day 2016 | Back to Basics Learning Dynamics, Inc. Celebrate National Read a Book Day! National Read a Book Day is annually observed on September 6th. The purpose of National Read a Book Day is to encourage people of all ages to spend the day reading a great book. Did you know that research indicates that early language experience actually stimulates a child’s brain to grow? And, reading to children gives them a huge advantage when they start school? That means that reading aloud to young children is more than just a fun, bonding experience for parent and child — reading is crucial to a child’s development. Extraordinary advances in neuroscience have been facilitated by the development of sophisticated research tools such as brain imaging technologies, making it possible to study the actual growth and workings of the brain. These new advances in research show that an infant’s brain structure is not genetically determined. Early experiences — like reading aloud — have a decisive impact on the architecture of a baby’s brain. And, when reading to babies and toddlers, cells in the children’s growing brains respond. Some brain cells are ‘turned on,’ triggered by this particular experience, existing connections among brain cells are strengthened, and new brain cells are formed. The development of early literacy skills through early experiences with books and stories is critically linked to a child’s success in learning to read. Development of literacy is a continuous process that begins early in life. And, children who are read to from an early age are more successful at learning to read. KandooKids.com explains, “Dialogic Reading is reading in which the adult helps the child become the teller of the story. The toddler or preschooler becomes an active participant in the book and in effect creates a conversation about the story. When children are read to dialogically they can improve their language abilities and increase their vocabulary. Children are better able to identify sounds and letters and even demonstrate emergent writing skills. Dialogic Reading can help build a stronger relationship with your child while improving these important skills! 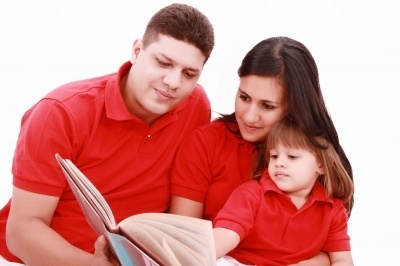 Read picture books that illustrate a sequence of activity that your child can easily follow. • Pick books with colorful illustrations and minimal text. • Actively involve your child in the book. • Teach your child to become the story teller. • Make comments about the pictures and wait for your child to respond. • Ask questions about the pictures and wait for your child to build upon the dialogue. • Respond to what she or he says about pictures by adding just a little more to her or his comments. To get your family started in a read aloud program, Back to Basics Learning Dynamics has compiled a list of must-read children’s books by age category. These are some of our top picks that both children — and parents — will love. And, if your child is struggling with reading skills, or simply needs a little extra help, Back to Basics Learning Dynamics in Wilmington, Delaware can help. In addition to our 1-on-1 tutoring for reading and reading comprehension for student of all ages, Back to Basics also offers a summer program to help kids conquer summer reading lists. Our experienced instructors will work 1-on-1 with your student to read, comprehend, retain and apply summer reading material. These sessions will provide students with the knowledge and confidence to complete any required reading-related assignments, such as reports, projects and tests. Available at your home, day camp, or in our Newark or Wilmington locations. Back to Basics Learning Dynamics is the undisputed leader in 1-on-1 tutoring in Delaware and southeastern Pennsylvania for over 60 subjects. The company also offers 1-on-1 SAT Prep, ACT Prep, and Test Prep, translating and interpreting in 21 languages, homeschool support, educational testing and more. For more information about Back to Basics’ educational services, please call us at 302-594-0754. Back to Basics operates a unique Department of Education-approved 1-on-1 K-12 Private School in Wilmington, Delaware. For more information about Delaware’s only Department of Education approved 1-on-1 private school, please call us at 302-594-0685. Photo by David Castillo Dominici and FreeDigitalPhotos.com. Why it's important to read aloud to young children! November is Picture Book Month. Celebrate with a great read! Celebrate National Library Week April 12-19, 2015! It's Teacher Appreciation Week and time to celebrate exceptional teachers nationwide! May is "Get Caught Reading Month." Back to Basics helps with a free children's book giveaway! Delaware’s 9th Annual Conference on Education is fast approaching!